“These horses are booked into Valley Auction’s THURSDAY Feb 25th SALE…. viewing will be permitted from Saturday the 20th on at the Valley Auction Sale Yard. Please remember these horses have been abandoned since June 2015 and MUST BE SOLD THROUGH PUBLIC AUCTION….. no one is to attempt purchasing them private prior to the sale…. go meet them…. they are super friendly and looking for attention. Please also note, there is no registration papers or confirmation of age available, these are just guesses listed below…..
1) Black stallion, thinking around 4 years old. 1) Buckskin, seems gelded, maybe coming 2 years old. 1) Mature bay brood mare, seems heavily in foal, quiet and gentle, stands about 14hh if that. 1) solid face bay mare, might be coming 2. 1) wide blazed bay mare might be coming 5. 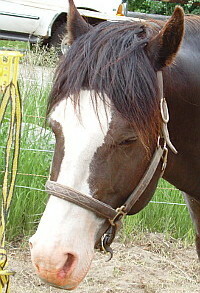 1) bay mare with star stripe snip seems to be about 3 years old…. Previous stories here and here. I thought you might be interested in this. On Monday, April 20, we spotted an unusual visitor to Coalmont. 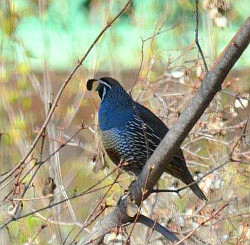 This lovely California Quail spent well over an hour perched on some brush in our little community. It is extremely unusual to see them around here. It certainly is the first one we have seen here during our 6 years in Coalmont. Many long-timers we have talked to say they have never seen or heard of one in the Tulameen/Coalmont/Princeton area. We don’t know if he has decided to stay in the area, or if he has any other friends or family with him, but we would be thrilled if he decided to make Coalmont his home. Hopefully others will get to see him, and find that he has set up housekeeping here. He would be a welcome neighbour, in our opinion. The Tulameen River this morning looks like time has forwarded to Spring freshet. It is amazing the havoc weather can create and so suddenly. As I look out, the temperature has been plummeting and the downpour of rain all night abruptly turned to snow. At least it is a dry snow, not the heavy wet that contributed to the ice jam on the river. We will have to wait to see if we are out of the woods yet. Come spring there should be less debris floating down the river to cause problems if what is going by our place is an indication. The Tulameen Fire Department deserves commendation for their proactive action in going door to door alerting residents of the possible danger, and to be prepared in case an evacuation was needed. I would like to be able to commend Argo Road Maintenance as well, but they have done nothing in our community to be commended for as we waited to see what might happen. If you own a 4×4, or live along Coalmont Road, evacuation would not have been a problem, as it is well maintained. For those of us who do not fall into that group, the condition of the side roads was and still is this morning deplorable. Unnecessary delays and serious problems may have occurred. Normally I would not consider this an issue as I realize we are low on the priority list for ploughing, and every one works around this. When such a serious issue as this occurs, standard procedure would be to alert all civil authorities of the danger. If Argo was proactive, the very first thing on their priority list should have been to dispatch a plough truck to address the situation. Thankfully we seem to have dodged a bullet this time and may we never need to be placed in this position again. The “Meet The Candidates” evening at the Coalmont was well attended. In fact it looked like a full house. People came from Missezula, Erris, Eastgate, and other communities. The evening started out with a welcome from Chris Berringer who managed the whole event with skill and sensitivity. The three candidates each gave a short description of their platform and point of view. The incumbent Area ‘H’ director, Brad Hope, was also on hand to answer questions. Jamie Frandsen spoke next. Many years of him and his family visiting the Area makes him well connected here. He considers safety on the highways important’ and a pressing reason to improve the hospital. About himself he said: “I’ve got business sense” and mentions his history with the printing business. “I’ve got environmental sense” and mentions that his company was a pioneer in the use of environmentally friendly ink. He mostly considers what Weber said to be his platform too. The meeting continued with more statements from candidates and some questions from the floor. Two people asked about Charles Weber’s slogan “Time To Grow” but again his answers did not clarify whether he meant Princeton or the communities, or what kind of growth he is referring to. He did say that he thinks “we need more revenue” and we can achieve that by getting more people to move into the area which will lead to more industry. Jamie Frandsen said that there is revenue from Weyerhaeuser coming in, but Bob Coyne corrected him, saying that this is the Forest Corp money we’ve been talking about. Coalmont resident Bob Sterne asked about the supposed $350,000 that Princeton expects (according to Princeton mayor Frank Armitage in a recent newspaper article) from the merging of Copper Mountain as a satellite to their town and how the candidates viewed that, or planned to get that money back to area ‘H’. The subject then moved to the seemingly ever present Princeton pool discussion. Frandsen said “they’re going ahead” and when asked if we (Area ‘H’) would get to vote, said “I hope so”. Bob Coyne was more specific and said “there would have to be a referendum”. A question from the floor for Charles Weber: “What is your position on a pool in Princeton and if your view is different than your constituents wishes, are you willing to follow their lead?” Weber replied simply, “Of course”. But the pool questions continued: “The reason I’m asking is that three years ago, over 900 taxpayers signed a petition asking for a separate vote in the referendum. However, you spoke at the public RDOS meeting and tried to convince the board to force area ‘H’ to a combined vote with Princeton. My question is, would you again go against the wishes of the majority of area ‘H’ residents about any issues arising.” Weber’s reply was, “That was a different situation”. Weber went on to say that “it split the community” and put a lot of pressure on him. Who put that pressure on you, someone asked. He replied, “Some people would say I did, some people would say Brad did.” He was also asked “Are you for the regional district or are you for Princeton?”. His response was “I’m for the regional district”. Regarding the last pool vote, someone from Eastgate asked why we couldn’t have one vote per property instead of one per person. There was no clear answer, though there was a general deferral to the BC elections laws. Bob Coyne asked the person if he thought that his neighbour who had 60 properties, should get 60 votes. Bob Coyne was more specific: “we need a stable hospital with enough staff to operate in a sustainable manner” suggesting too that doctor retention is a priority. Weber added some more: “doctors should be at the table” and “this is part of what growth is all about”. He also thought that “we need to insist that paramedics are upgraded” and “we need a walk-in clinic”. Getting back to the talk of communities, Weber said “A big part of what Brad has done in the last years is build these communities”. But, someone asked, “all the communities have different priorities, how do you differentiate?”. Weber’s response was, “I would like to see the APC (Advisory Planning Commission) have an expanded role” but added “I think you need representation from the different communities”. At this point a break was called. People chatted and enjoyed the warm and colourful atmosphere at The Coalmont. The conversation with the candidates then resumed with some miscellaneous questions. A woman mentioned the Missezula lake road and their special situation with something like 80% part time residents. When it comes to election issues, “it’s hard to get them going”. Also “nothing gets done with the road”. It’s such an issue that people who haven’t been there in years still ask “what’s the road like now?”. Bob Coyne was able to add some clarity to that issue and said that “The government doesn’t own that road. It is on private land and they only maintain the running surface”. The main questions having been discussed, and the audience seemingly satisfied that they got what they came for, Berringer asked the candidates for closing remarks. Jamie Frandsen: “Thanks very much for coming”. Bob Coyne: “Awesome experience” and “it doesn’t matter who you elect, but please get out and vote”. Once again, the phone lines to Coalmont are down, there is no dial tone at all…. This has happened twice already this winter that I am aware of…. On Jan. 3rd the Coalmont Hotel caught fire, which is adjacent to our property, and if the phone lines had been out, we likely would have lost our house…. The phone line to Coalmont isn’t buried, it isn’t strung on poles, it is lying on the side of the road, along the bank, tied to trees and rocks, for a distance of about a kilometer…. Is this what you consider to be a proper installation, because I think the TV Stations and Newspapers I am CCing on this email might well disagree…. This is indeed a serious matter, but what is particularly interesting is that Telus appears to be hiding the fact that they are unable, or unwilling, to provide an acceptable and safe level of service here. On the Telus “Home services outages” web page, Coalmont or related areas, are not listed. Why is that? Not under “Current outages” during our blackouts, nor under “Resolved outages” afterwards. The Coalmont Little Free Library has been quite a success. You will find it on the south east corner of Parrish and Main, mounted on the fence. Yes, you read that right. If you haven’t seen it yet, do have a look. The concept is simple: take a book, leave a book. If you don’t have one to leave, take one anyway. Nobody should be without something to read. In the past year, Little Free Libraries have grown and spread around the world. We know that there are funny, heartwarming and inspirational stories behind many of these Libraries. We want to hear those stories! So, we are excited to announce Little Free Library’s first ever Online Film Festival. 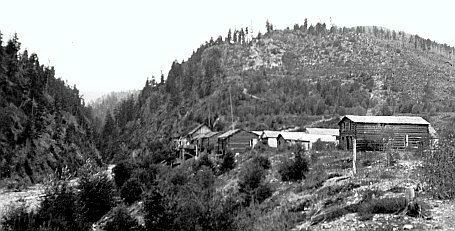 The Granite Creek townsite is an important historical place for out area. In that regard the Courier recently received this letter from Bob and Diane Sterne. We feel it is time our local government steps in to protect historic sites in this area. As many know, our passion is the local history. For years we have been asking to have the Granite Creek town site (which is on Crown land) protected. We have asked it to be put on the RDOS Heritage Registry. Currently there are no Area H locations on that registry. They go on to talk about the “thousands of pioneers” who came here looking for gold, adventure, and a good life. Let’s not turn a blind eye to what they did for our valley. Don’t you think it is time our government did something to protect the legacy of these prospectors? Isn’t that the least we can do to honour their memory and thank them for opening up our valley? Perhaps RDOS will listen if more people petition them to protect the Granite Creek town site. We are only two voices, but surely there are others who agree the site should be recognized and protected. If you agree, please send an email or letter to RDOS asking them to add the Granite Creek town site to their Heritage Registry and to turn it into a park to protect it from vandalism and digging. The address of the regional district office (RDOS) is 101 Martin Street, Penticton, B.C. V2A 5J9, and their email address is info@rdos.bc.ca. 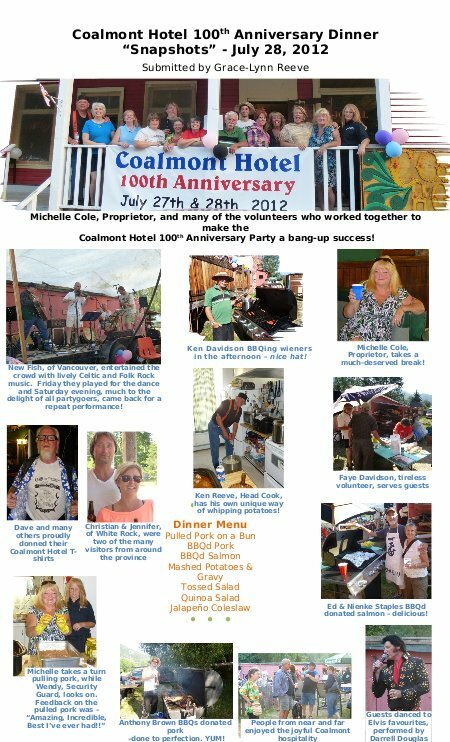 The big centennial celebration at the Hotel July 27 and 28 was a huge success. There were perhaps 200 people present for the dinner and the band played both Friday night and all day Saturday. Here is a picture collage that was sent in by Grace Lynn Reeve. It tells the whole story. The Princeton Save Our Hospital Coalition would like to invite everyone to a Public Forum to discuss solutions to the health care problems in our community. The Forum will be held on June 21st at Riverside Community Centre beginning at 7:00 pm. As you are aware, the Interior Health Authority recently instituted scheduled closures of the Emergency Room at Princeton General Hospital. These closures represent the latest in a long sequence of cutbacks that have a negative impact on our community. Please join us to hear what our elected and appointed representatives have to say. The public will also have an opportunity to ask the panel questions. 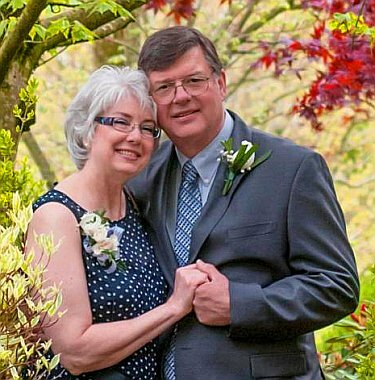 Ken and Grace Lynn Reeve are very pleased to announce their marriage of May 4th. The very mention of motorized vehicles using the Trans Canada Trail can stir a heated variety of emotions both for and against it. The fact is, at present, there is absolutely no law against the use of motorized vehicles on the Trail. While the Vermilion Trails Society (stewards of the trail from Brookmere to Osprey Lake) does not officially condone such usage, it’s members are committed to supporting the Directions and Laws, as they pertain to the Trail, by the Provincial Government and Trans Canada Trail. As stated, at present, there is no law that bans motorized usage of the trail. Bill Allinott, the Trail Maintenance In Charge and a Director of the society, on Jan. 11, 2012 spoke with Sgt. Clare of the Princeton R.C.M.P. who confirmed the matter had been looked into extensively and that there is no authority to enforce usage by A.T.V.’s or other motorized vehicles – that includes the portion of the Trail in the Town of Princeton. The usage of helmets, proof of insurance, a maximum speed of 20kph, and crossing of roadways (while riding a vehicle) that intersect with the Trail are enforceable. Trans Canada Trail has eliminated funding in other provinces where the Law is permitting and promoting motorized vehicle usage, but to our knowledge there is no official direction to cut off funding to stewards of the trail that abide by the Laws pertaining to Trail usage in British Columbia, as long as the society is not promoting motorized usage. Until we see an official change of policy from the BC Government and Trans Canada Trail, it is the position of several of our Directors and members that we should maintain our current position with regards to usage, which is neither promoting nor forbidding their use. The recent adoption by the Town of Princeton to designate the urban portion of the trail as non motorized is premature in our opinion. While it’s intention was to ensure funding, and possibly deal with other issues, we agree with statements from the Mayor, Fred Thomas, that the decision was made in haste and more homework should have been done. The request to designate the trail non-motorized did not come from the Vermilion Trails Society, and is not the correct way to proceed in the opinion of several of it’s members. The society members are stewards of 113 kilometers of trail which they receive funding for. The VTS section of Trail covers various areas – Thompson-Nicola Regional District, Town of Princeton, and Regional District of Okanagan-Similkameen. The funding that is received from Trans Canada Trail covers all sections of the trail. Until the government of B.C. officially designates the Trans Canada Trail (in B.C.) as non-motorized, the 5 kilometers of trail (approximately) in the Town of Princeton will have no bearing on whether or not the Vermilion Trails Society receives funding. Indeed, by informing the public of false positions on usage, it can lead to problems such as Mr. Hassell reported about a child being slapped for riding an A.T.V. on the Trail. Current signage present in many locations that show motorized vehicles other than snowmobiles being banned already creates friction. These signs are posted under the direction of Trans Canada Trail who oversees the trail system. Although they are not reflective of the current law, they mandate they be posted on the trail system. Encouraging the public to police the trail with a mistaken understanding of the Law encourages some vigilantism, which will only result in well meaning members of the public being charged for trying to enforce a law that doesn’t exist. This is a position no one wants to find themselves in, and one we personally would hate to see develop. Education and common sense is the key to ensuring a harmonious usage of the Trail. When walkers, bike riders, or riders on horseback are present, slow down, pull over, or stop and show some courtesy. Hikers should walk single file when bikers approach so there is room for all to pass safely. Noise levels should be kept to a minimum to allow all users to be able to enjoy the natural wonder of the trail. The trail surface should not be damaged by irresponsible actions. Litter should be placed in trash cans or packed out. Dust should be kept to a minimum. It is hard enough for our police to try to enforce the current laws to control discourteous drivers on our highways, so enforcing the remote and urban areas of the Trail would be a daunting challenge, especially when we are asking them to enforce a law that doesn’t exist. It is even more absurd for us to encourage the general public to police the trail against those who use it within the letter of the law. It is still important for the general public to observe and report anyone they see vandalizing the trail, or endangering others. It is our hope that the Town will reconsider this issue and abandon their position until the Government of BC officially changes their designation on the remaining (and much larger) section of the trail outside of the Town of Princeton. We feel this will alleviate a lot of the tension that is being felt by the diverse user groups of the trail, as they will not be given confusing information that leads them to believe the rules of usage are different from what the law actually states. This letter reflects the opinions of the undersigned in response to the recent information and actions that have resulted in the mistaken perception that the request to ban motorized vehicles came from the Vermilion Trail Society. 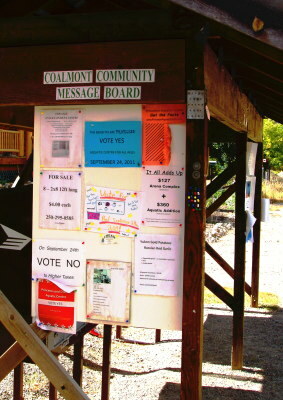 The new Coalmont Community Bulletin Board is already much used, which shows that it was something we really needed here. It was provided courtesy of the Mozey-On-Inn. Although (as one person reports seeing) it would appear to be a problem with people from out of town, it is clear that not everybody shares the Coalmont spirit of community. Of course the board is for everyone, but regardless of where you’re from, good manners apply here. This prompted the following letter to the Coalmont Courier. Most have probably noticed the new Coalmont Community Bulletin Board that we placed near the mailboxes. We felt it would be a nice addition since it was becoming more and more difficult to read the notices which were being put up. Unfortunately, with the Pool Referendum around the corner, some have decided that their point of view is more important than others and have been removing notices and replacing them with those showing a different point of view. We would remind everyone that we are a community, and as such are made up of individuals who will have different points of view. Your point of view is not more important than those of others, and you have no right to remove their notices from the board. The only time it would be appropriate to remove notices from the board is when they are obviously expired. We hope everyone will practice bulletin board etiquette. Please show respect for your friends and neighbours and set an example for the children in our community. This is a perfect opportunity to teach our children how democracy works and that everyone is entitled to their opinion. On Saturday, September 24 a referendum will be held asking residents of Princeton and Area H for approval to borrow 6 million dollars to build an Aquatic Centre in Princeton. If the referendum passes, it will mean that annual property taxes will go up by $287.00. The tax increase will be a “parcel” tax which means that each property will pay the same amount regardless of the assessed value of the property. Only properties with improvements on them will be taxed. Vacant lots will not be subject to the parcel tax. However, if someone owns more than one lot with a house on it, they will have to pay for each lot. It is hoped that federal grants, provincial grants and donations will raise $3 million. The remaining amount will be borrowed by the Town of Princeton and Area H. The loan will be amortized over 20 years with a projected annual rate of 4.25% for the first 5 years. It’s important that your voice is heard in this important referendum. Information regarding polling stations will be made public at a later date. There will also be arrangements for advanced voting and a Mail in Ballot for all residents that meet certain criteria. Argo – Call Before You Dig! 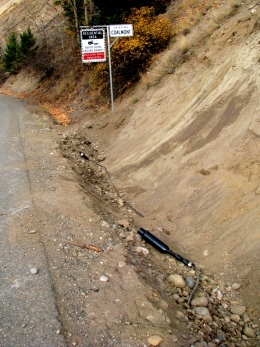 In the morning of Monday, October 25, 2010 Argo Road Maintenance were digging along the base of the slide area just outside of Coalmont to make a place for the ineveitable rocks to land instead of as many ending up on the Coalmont Road. Unfortunately, somebody at Argo forgot to “Call Before You Dig” ! When we came home from Keremeos at 11:30 AM we noticed a Telus truck stopped right at the new “No Jake Brake” sign entering Coalmont from Princeton, and two men working on a rat’s nest of cables sticking up out of the ditch. Telephone service was out until sometime in the afternoon. After having problems with our phone service later in the evening, I emailed Telus and spent 46 minutes waiting for their “instant chat” repair service. We were assured that there was no reported service outage in Coalmont and if we were experiencing problems it must be our line. If they couldn’t repair the problem at their end, Telus would make a repair call on – get this – November 9th! This morning, I went over and took a photo of the area. It is clear that the phone problem was not caused by our line. You can see the exposed phone cable, lying in the new ditch that Argo have dug – and there are two brand new splices. Coalmont has been a happening place lately with new folk moving into town. One couple has purchased 1870 and 1874 Fraser Street. Where are those addresses, you may ask? 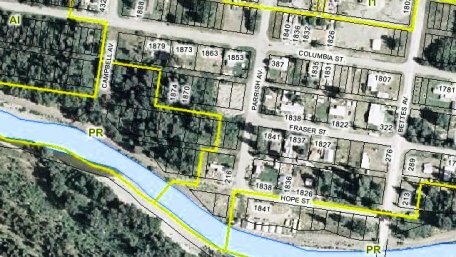 Until now, there was no road access to the lots because Fraser had never been pushed through between Parrish and Campbell. This couple’s lots are located smack in the middle of the block and are zoned residential. In order for them to get to their property, they need road access. According to the owner, he contacted RDOS and they said the road already existed. Once again RDOS doesn’t really know what is happening in our town because everyone here knows there isn’t an actual road there, it is only shown as a road on the map which was drawn in 1911. The man said he told RDOS there wasn’t a road there and they said to contact Highways to have it put in. The man told us he contacted Highways and they said they wouldn’t put in the road, but that as long as he stayed within the road allowance for Fraser Street, he could put one in. Once he put it in, it would become public access and he would have to ensure it was never blocked off. After contacting RDOS once again, the man told us he was given the go ahead to put in a road. His intentions are to put through a narrow road approximately 15 ft. wide (within the 66 foot road allowance) and he would try to wind it around existing trees as much as possible to minimize the disturbance. Since RDOS didn’t seem to care which direction he brought the road in, he chose to come in off Campbell. As he explained to us, he thought it would have the least impact on the neighbours. His intentions were sincere and good. Not everyone is aware of the septic rules, and how they are changing. Some people who have unnescessarily sold property because they thought they couldn’t put a septic on it, when in fact they could, feel they have been wronged. Other situations exist where things have gone awry. The government administration’s lack of communication, clarity, and coherent operations, is causing hardship for some people.